Limited to 300 copies - Masada was conceived in 2008 by guitarist Chris Milewski with the intention of not only creating aggressive music, but also something that involved a sort of uniqueness and thought. Chris was soon joined by renowned drummer Craig Smilowski (ex-Immolation, ex-Goreaphobia, Rellik,) bassist Matt Dwyer (Rellik,) and vocalist Cazz “The Black Lourde of Crucifixion” Grant (Crucifier.) In May 2011, the "Suffer Mental Decay" EP was released to great reviews and a great response in the underground Death Metal scene. In 2012/2013 Craig Smilowski and Matt Dwyer were eventually relieved of their duties in Masada so that they could focus on family and their main musical endeavour - Rellik. After a futile search for replacements, Cazz, being a drummer, naturally stepped up to sit behind the kit and Chris took bass duties. 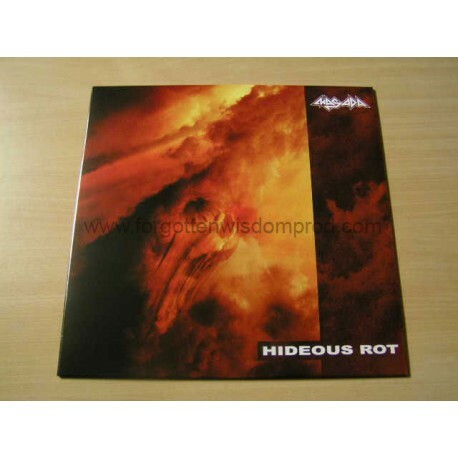 In February of 2013, as a two-piece, Masada recorded the "Hideous Rot" tracks that are to be released (along with the "Suffer Mental Decay" EP and a special track by Clive Jones of Black Widow).